I love this word! As performers… taking a break is often just as important as working your tush off! So, when I see this symbol it reminds me, “Hey! Taking a break is OK!” Basically, when you see this symbol in a piece of music it means either the musician/singer or conductor can take a pause without messing with the rhythmic structure of the measure. If your in an audition, it means the accompanist will follow your lead on how long of a pause to take. Don't over do the pause, but definitely enjoy it! 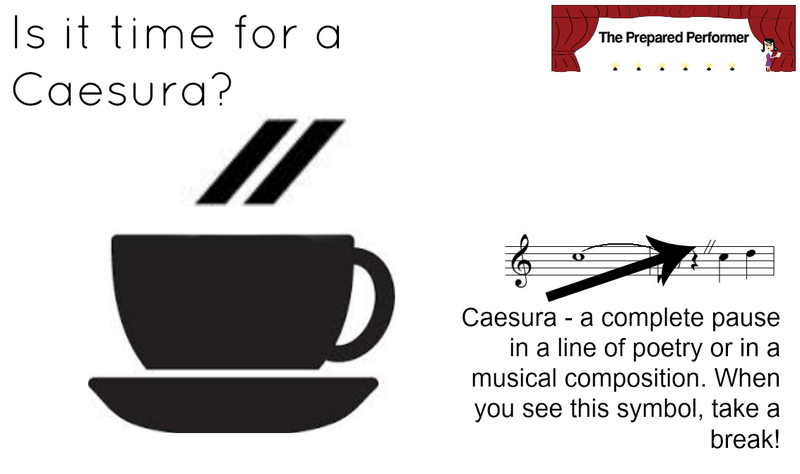 Caesura – a complete pause in a line of poetry or in a musical composition. When you see this symbol, take a break!